Home Editorial Scrutiny: How is the Chief Justice of India impeached? Scrutiny: How is the Chief Justice of India impeached? On Friday, April 20, 2018, Opposition leaders met Chairman of the Rajya Sabha M. Venkaiah Naidu to hand over a motion to impeach Chief Justice of India Dipak Misra. 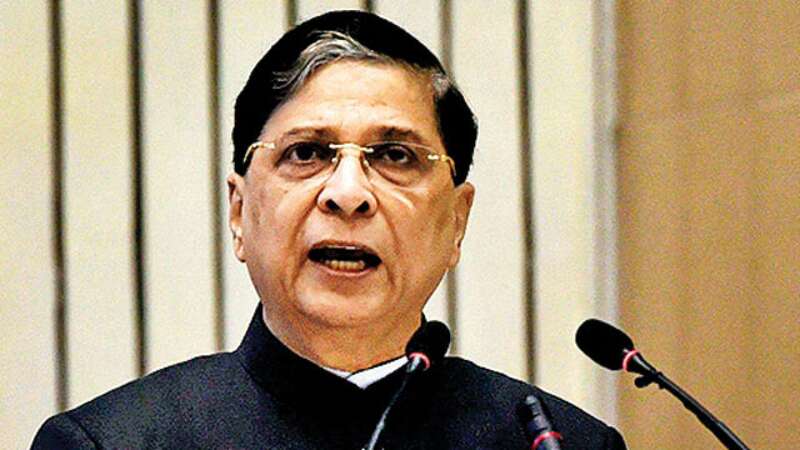 Chief Justice Misra is the 45th Chief Justice of India, and has been in his position since August 2017. Here we have a detail explanation and scrutiny regarding this issue by Sruthi Radhakrishnan and Shubhankar Dam. How can Parliament impeach a judge, and a Chief Justice at that? Just like all other constitutional positions, the Chief Justice of India can also be impeached provided the necessary steps as laid out in the Constitution are taken. This is not the first time impeachment has been mentioned in the same sentence as a sitting judge. Justice V. Ramaswami was the first judge against whom impeachment proceedings were initiated. How will they go about it? 100 Lok Sabha MPs or 50 Rajya Sabha MPs is the minimum number of signatories required to issue the notice. Who gets this notice and what should they do? The notice has to be handed over either to the Speaker if it is from Lok Sabha MPs or to the Chairman if it is Rajya Sabha MPs. The Chairman of the Rajya Sabha is the Vice President of India. If and when the motion is admitted, the Speaker or the Chairman will have to constitute a three-member committee to investigate the charges levelled against the Supreme Court judge. This committee will consist of a senior Supreme Court judge, a High Court judge and a ‘distinguished jurist’ — who is a highly qualified law professor who has been appointed as a Supreme Court judge by the President of India. The three-member committee has to support the motion for it to be sent back to the House where it was introduced. In the House, it has to be discussed and passed with a special majority — not less than two-thirds. This means, in case of a full House seated, at least 364 Members should be have voted for the motion in the Lok Sabha, and 164 Members in the Rajya Sabha. This will then pass on to the other House where it has to be passed by special majority again. Once it passes both the Houses of Parliament, the President can be approached to remove the Chief Justice of India. - Resource Credit. How technology can bring transparency to India’s divided supreme court? India’s supreme court is a beleaguered house. Months after four judges pleaded their anguish against chief justice Dipak Misra, the feud has only turned more bitter. The court has since endlessly wrangled in public. Judges have berated one another, resorted to innuendos, and conferred through the press. It’s an indignity, a descent into pettiness, that makes one wonder: Why has it come to this? Will it end? How? A suite of issues is boiling the pot: Demand for an investigation into the death of trial judge Brijgopal Loya (now harshly rebuffed by the court), the Narendra Modi government stonewalling high appointments and, above all, the method of allocating cases in the supreme court. This latter concern has invited intense heat. Within a span of six months, the court twice issued rulings affirming the chief justice’s untamed discretion to assign matters. But naysayers persist; they want reforms. Another petition is up for hearing. Will anything change? Every year, Indians besiege the supreme court with petitions in the thousands. The court has only 31 judges to bring peace to this pile of disputes. All judges can’t hear all matters; they must divide labour. The supreme court has only 31 judges. All judges can’t hear all matters. Ordinarily, judges sit in pairs. To decide cases, both must agree on the outcome. Usually they do. But differences crop up at times. The practice: Intimate the chief justice, request a larger bench. These requests may arise in other ways, too. The court works hard; multiple benches grind alongside. Different benches may interpret the same law in conflicting ways. This often happens. Who is to lay down the “correct” law? Again, a larger bench must convene. So, large benches ease conflicts within and among smaller benches. But they do much more. India’s legal system is precedent-based. In theory, like cases are decided alike. Judges consult similar cases from the vault to resolve pending ones. This keeps the law predictable. But this art of precedents is wedded to a democratic logic. It has two facets. One, large benches always bind smaller ones. In 1973, India witnessed one of its largest ad-hoc benches. It had 13 judges. They assembled to parse the Constitution’s amendment powers. Seven of them, a slim majority, voiced a new rule: Some ideas in the Constitution (democracy for example) are so basic that parliament can’t amend them. This rule now binds all benches of a dozen or fewer judges; they can’t overlook the decision. Two, only a larger bench may overrule a precedent. What would it take to set aside the 1973 rule? A still larger bench: 14 judges or more. Of them, a majority must strike down the rule. The court hasn’t convened such a bench in five decades. So, the 1973 dictum endures. Clearly, large benches do more than settle clashes. They interpret the law for the court’s regular benches, for high courts, trial courts, and tribunals, indeed, for all else in India. They are the real lawmakers. The power to convene large benches, effectively, is the power to shape the law in India. The power lies in four decisions. One, necessity: is a large bench needed? Two, size: how large of a bench? Three, presence: which judges should sit on it? Four, time: when should it commence hearings? These are weighty questions. Who should umpire them? In November 2017, chief justice Misra hurriedly assembled five judges to proffer a clarification: Power over all bench-related matters, big and small, vests solely in the chief justice. Recently, in Asok Pandey’s case, the court spread out a buffet of arguments echoing this stand. But are the dishes too stale? The chief justice is the administrative head of the court. The Supreme Court Rules, 2013 (SCR) make him the “Master of the Roster,” the court says. His status enables him to summon benches and traffic cases to his liking; there are no limits. End of matter, then? It isn’t. The Constitution—Article 145—empowers the court to erect rules. Thus came the SCR. The chief justice owes his power to these rules. If they change, so will his powers. Can the SCR change? They can. They have. Many times, in fact. Notice: The rule-making power rests with the court, not the chief justice. The court, collectively, polices the chief. It may endow him with powers; it may wrench powers from him. Talk of inherent powers—of “exclusive duty and authority”—is sheer humbug; the chief justice enjoys no such thing. To allay fears of abuse, the decision also served rich helpings of a “trust” dessert. Infinite discretion is a recipe for caprice, petitioner Pandey had implied. The chief may scheme in enlisting benches; he may sate them with sympathetic judges; he may rig outcomes. Fear not, the court reassured. The chief justice is a constitutional elder—he’s an “institution in himself”. It’s wrong to mistrust him: His oath renders him beyond reproach. These are insufferable apologies; they are beyond bad. The president, the head of the state, the supreme commander of the Indian armed forces, is accountable. The prime minister, the head of government, is accountable. Governors too, as are ministers and bureaucrats. Why not the chief justice? Judges aren’t superhuman avatars. Virtues and vices of fellow elders may visit them, too. Also, oaths don’t assure propriety. All high offices swear oaths. But they aren’t free from audit. Why should the chief justice be? Remember: Judges aren’t superhuman avatars. Virtues and vices of fellow elders may visit them, too. The decision is a manifesto of unreason. It highlights a history of constitutional divide. The court for long has brandished the Constitution like an unrelenting trident. It reached deep into Indian life, slashing the executive, the legislature, even private persons. Verdicts recited a tireless mantra. Power: Reasonable, proportional, accountable. Slayed of its imperial trappings, public power reappeared in India, humanised. But reasonableness is a two-way street. The trident now is hurrying towards the court. Escorting the chief justice away from the logic of accountability creates a caste of rules: One for judges high up, another for all else low down. This pyramid is an abuse; it won’t last forever. A reckoning will come, eventually. Small benches: What are they hiding? What about regular two-judge benches? Mostly, they shoulder the dispute-pile. But unlike large ones, they have dodged a sharp spotlight. How do cases reach them? Is an invisible hand instructing traffic here, too? Until the early 1990s, the chief justice manually helped pair small benches with cases. Predictably, it incited bench-hunting. Crafty lawyers perfected the art of spotting sympathetic judges, and laboured to appear before them. Then came the computers. Mid-1990s. The registry, the courts’ administrative seat, mechanised in bits: Filings, notices, listings etc. By late 1990s, computers handled case allotment, too. Now a software randomly matches cases, benches, and judicial expertise. It’s a low discretion, low abuse regime. The software is India’s Solomon; on its efficiency rests the image of impartial justice. Are Solomonic allocations faithfully obeyed? It’s hard to tell. Officials flag “controversial” petitions to the chief justice for advice. How often? “Occasionally,” said a staff member. A retired chief justice differed: “Only very rarely,” he insisted. Neither, though, assigned a digit. The deviations must stop; they fuel doubts. Breaches apart, random allotment for small benches is a candid system. Should large ones adopt it? Forbidding the chief justice his “Master of the Roll” status will unleash bedlam, the court thinks. Judges may install a grab-what-you-want system, turning courtrooms into a chaotic bazaar. This is false. Discretion or disarray aren’t the only options. Orderly alternatives abound. In his petition, Pandey proffered a formula. A large bench, say, a five-judge bench, should always include the three senior-most and two junior-most judges. (Seniority is a function of tenure, time served, not age.) The court rejected the idea. And rightly so. A formulaic rule is unfair. Judges in the middle can’t play lawmakers—nurture the law, cultivate their jurisprudence, and fortify their legacies. Better to trust the software. We do it with small benches. Why not large ones, too? Assembling ad-hoc benches is a balancing act. Many factors matter; timing and expertise matter most. Large bench proceedings drag for long periods. So, judges nearing retirement are out. Also, judges specialise. They prefer some areas of law over others. Does trusting a software diminish the chief justice? It didn’t in the 1990s; it won’t now, either. These issues don’t pose problems. The software has a mind; it can learn. It already does. Does trusting a software diminish the chief justice? It didn’t in the 1990s; it won’t now, either. Besides, the chief justice remains the master. He retains discretion on two matters: Is a large bench needed? How large? This proposal only outsources two other decisions: Who—which judges—should make up a large, ad-hoc bench? And when? Immediately, on receiving a request. For too long, the court has strategised, assembling large benches on some matters, avoiding them on others. The supreme court sits on a blockbuster docket: Ayodhya, polygamy, demonetisation, and many more. The outcomes will revise an ancient republic in unknown ways. Much is at stake. But the court is struggling. There’s dissent in the ranks, division outside. Yesterday’s Loya verdict, its scathing temper, is an omen. Splitting discretion with a software in these troubled times profits chief justice Misra. Volunteering transparency has benefits: He can reassure doubters, rally believers, restore the court’s majesty, too. And he will renew the people’s faith in the words he swore: To perform “duly and faithfully … the duties of [his] office without fear or favour, affection or ill-will.” Real courts are only of one type: impartial. The Indian supreme court must prove it isn’t anything else. - Resource Credit.